The air distribution system is a critical HVAC system and key contributor to the effectiveness of this system in supporting displacement cooling. Namely, the effectiveness of this distribution system in being able to deliver air directly and at a sufficiently high volume and velocity to the work area floor to displace and occupy this work area air volume with air at the same temperature as the cooler outlet is the definition of displacement cooling. As shown and discussed throughout this website, displacement cooling results in work area temperatures seven or more degrees (F) lower than achieved using average building temperature. The typical resister (diffuser) that is found in most commercial and industrial facilities is designed to limit the jet throw distance and associated work area velocities to a maximum of 100 fpm a few feet from the face of the diffuser. These work well in air conditioned spaces where the duct outlet temperature is 55 F or less and the objective is to mix this air such that the work area temperature is the average for the building. 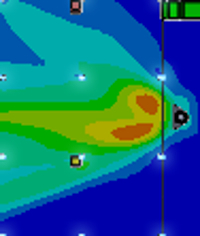 This is not the case for Evaporative cooled spaces where the duct outlet temperature during the monsoon season is greater than 68 F and it is very desirable to have the bulk work area temperature at this temperature. 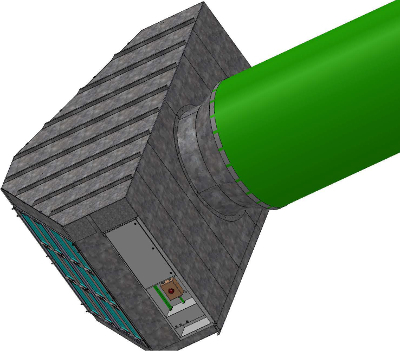 One example combination duct and diffuser from a facility being upgraded by AZEVAP among the many with similar observed measurements had a maximum floor level velocity 6 feet from the centerline of the duct less than 75 fpm and diminishing exponentially to nothing within a small distance from this centerline. This configuration also had dead spots in the areas where no air is being delivered to the work area. 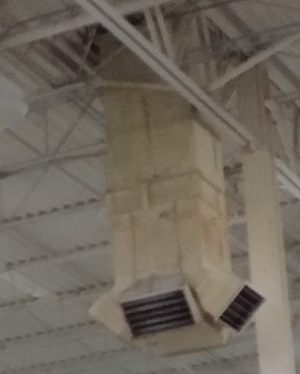 A photo of this typical duct and diffuser on a 12,000 cfm cooler is shown below. Unlike the typical duct and diffuser configuration, AZEVAP long throw diffuser ducts are designed to deliver large volume jets of air in a configuration that bathes the work area with cooler discharge air in a pattern resulting in velocities between 75 and 150 fpm throughout the work area. 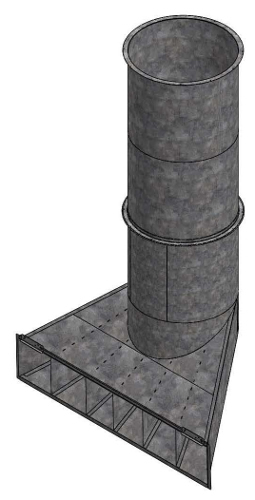 The models of these long throw diffuser ducts include, a) The Vertical Large Area Duct and Diffuser; b) The Vertical Directed Diffuser Duct; and c) FabricAir® Diffuser Large Orifice or Jet Ducts. 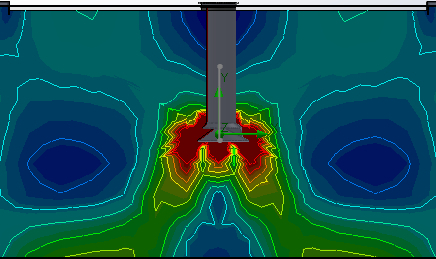 Each of these duct designs began with Computational Fluid Dynamic (CFD) analysis with confirmation of their effectiveness in meeting the operating facility performance objectives (both new and facility upgrades). 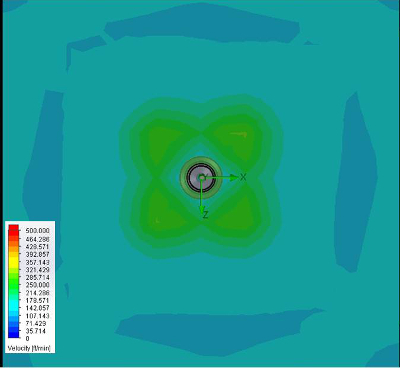 The 48,000 cfm versions of each of these long throw ducts along with the specific duct and facility CFD analysis results for the application are shown in the figures below. Other sizes of these ducts are available to fit with the needs of your facility. It should be noted that some specific criteria for the placement and orientation of the ducts are developed and applied prior to the fabrication and assembly of the ducts for shipment to the facility. 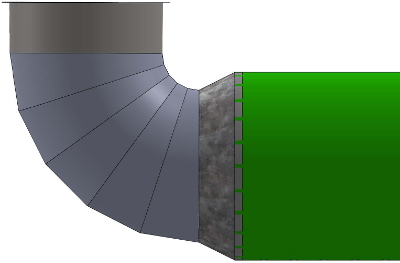 Results of Computational Fluid Dynamic (CFD)Flow analysis of Ducts as tailored to application is shown below.